We’d debated moving on today rather staying for the final day of this camp site’s season. However, the Mistral started blowing with some ferocity overnight and continued into the day. Since towing across the Mistral can be less than comfortable and since we have no pressing engagements, we’ve stayed put and will leave tomorrow as originally intended. En route to preparing for tomorrow’s journey to the Languedoc, i.e. buying food and fuel, we called in to an interesting show at the Val d’Enfer near Les Baux-de-Provence. In some of the cathedral-sized caverns left by the mining of the Bauxite there is a show that uses the flat, light-coloured walls as projection screens to show pictures to musical accompaniment. The content changes but is currently all to do with Picasso. The place is called the Cathédrale des Images and, when you see the size of the caverns used, you can see why. It’s an impressively constructed show lasting 45-60 minutes (I wasn’t counting). We’ve been intrigued by notices to control freedom of movement in the forest at certain times of day. There are clearly three risk level defined; orange, red and black. 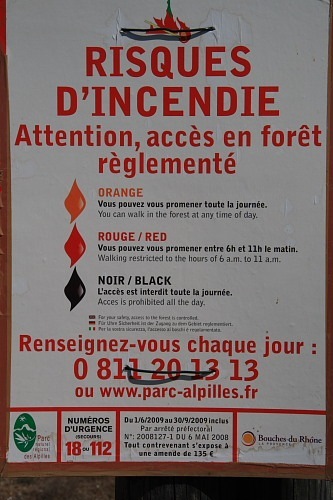 Orange allows you to walk in the forest at any time of day; red, only in the morning; black, not at all. What we haven’t discovered is what defines the currently applicable risk level. It seems a rather strange control to me. I assume any arsonist intent on wreaking havoc would know when they were permitted to enter to start a blaze. Perhaps it reduces the accidental risk of fires caused by careless smokers slightly. It seems we are to have visitors. Steve and Rosemary are currently in the north of France but have decided to head south to join us near Pezenas for a few days. Now we do have a pressing engagement. The weather forecast is looking a little shaky after tomorrow, though. Gulp!